These waffles make use of a gluten-free flour blend from NextJen.ca. Recipe courtesy of Chopped Canada winner Chef Shelley Robinson of Coast Coal Harbour Hotel. 2. Place all ingredients in a iSi whip cream dispenser, discharge 1 charge and then add a second charge. 3. Keep cold until ready to use. Use espuma to garnish quinoa waffle dish. 1. Cut the fennel bulbs in half and remove 2/3 of the core. Blanch the fennel in boiling water for 10 minutes and then plunge in ice water immediately. 2. Drain the fennel and dice very small (brunoise). 3. Bring sugar, star anise, vinegar to a boil, add fennel and cook until the mixture has reduced to a syrup consistency, but do not allow to caramelize. Finish with citric acid and white wine vinegar. 4. 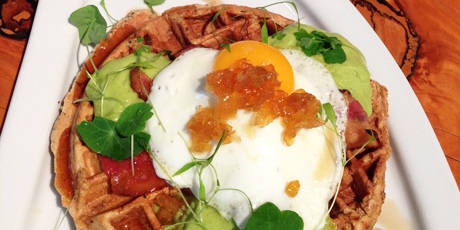 Chill and serve with on top of quinoa waffle with shaved turkey, bacon, fried egg and avocados espuma. 1. In a large bowl, mix together all dry ingredients. 2. Whisk wet ingredients into flour until fully incorporated. 3. Bake waffles as per baker instructions.